Welcome to the 16th annual event, starts Friday 11th May and ends on Sunday the 13th. The tournament is held in a school called "Gymnasiumskolan Metapontum” at the top floor of this huge building (built 1904-05) with good light and ventilation. - The theme will be East Front 1941-1945 between Germans & Romanians vs Russians. - Two Russian vs Japanese scenarios will also be provided in a Scenario reserve pool. ADDRESS: Metapontum Gymnasium (the huge lion-yellow building), located in the park called Långbroparken (Road: Stora Mans väg 11C). Located in the middle of a beautiful green park. Within walking distance (5-10 min) to good restaurants as the Långbro värdshus and an excellent Fish restaurant, there is also a Greek restaurant and two different pizza/hamburger eating places. There are also several food stores within the same range where you can purchase your own supply. The scenario pack, breakfast (Sat. & Sun. ), Coffe/Tea, prizes, etc. are all covered by the tournament fee of 300 SEK (30 Euros). The doors open at 12:00 on Friday (11th May), one hour before it starts and ends about 14:00 on Sunday (13th May). 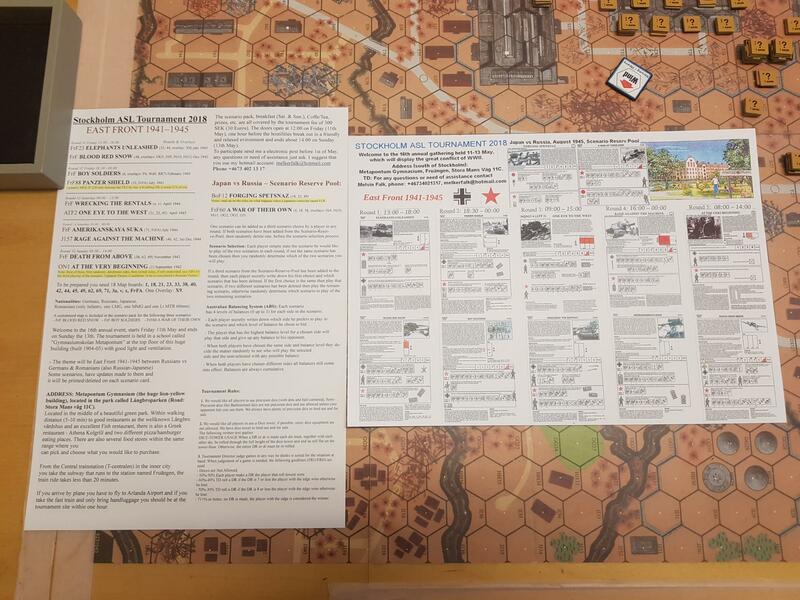 The scenario pack will be printed during this upcoming week and will also include 3 maps to three different scenarios (see link). Contact me if you want to have a scenario pack posted to you in March two months before the event starts. 1. We would like all players to use Precision dice (with dots and ball-cornered), semi-precision dice like Battleschool dice are not precision dice (SPD-Manufacture) and not allowed unless your opponent lets you use them. We always have plenty of precision dice to lend out and for sale. 2. We would like all players to use a Dice tower, if possible, noisy dice equipment are not allowed. We have dice tower to lend out and for sale. DICE-TOWER USAGE When a DR or dr is made each die must, together with each other die, be rolled through the full height of the dice-tower and end its roll flat on the tower-floor. Otherwise, the entire DR or dr must be re-rolled. 3. Tournament Director judge games in any way he thinks is suited for the situation at hand. When judgement of a game is needed, the following guidlines (FRU/FRD) are used. --- Draws are Not Allowed. ---- 50%-50% Each player make a DR the player that roll lowest wins. --- 60%-40% TD roll a DR if the DR is 7 or less the player with the edge wins otherwise he lose. --- 70%-30% TD roll a DR if the DR is 8 or less the player with the edge wins otherwise he lose. --- 71+% or better, no DR is made, the player with the edge is considered the winner. Germans, Romanians (only Infantry, one LMG, one MMG and one Lt MTR 60mm), Russians and Japanese. Thanks for the heads up Augie. The Boy Soldiers map with overlays have been prepared with 20+ copies. 17 scenario packs have now been posted , it contains 12 scenarios of which 6 of them are new scenarios. Tournament-scenario-display can be found in this link. Here is the link with ABS for the 12 scenarios, and HIP, ammo depletion# and quick footnotes what to remember to not forget. The Tournament rules have been updated. Last date to pre-register is 1st May. See you all on the 11th May, the doors will be open around 11:30-12:00 before the 1st round starts. Commanded by Patrik Manlig in the final. Congrats to Mattias for his victory.